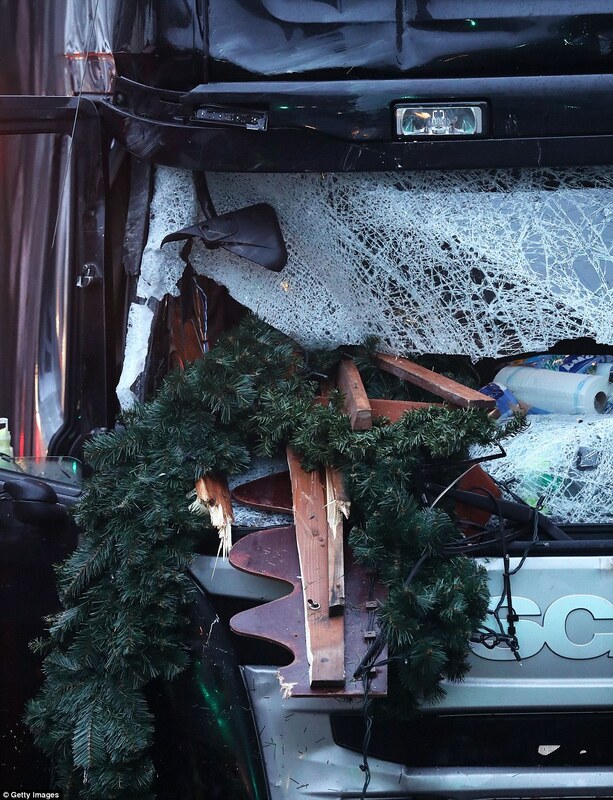 Berlin Germany: Another Terror Attack Killer Used Lorry To Kill 12 – Coercion Code – "Dark Times are upon us"
ISIS tonight claimed responsibility for the Berlin Christmas market massacre as German police continued to hunt for the killer amid warnings a second terror attack in the city could be imminent. The terror group hailed the lorry driver – who murdered 12 people and injured at least 48 others – a ‘soldier’ and praised him for ‘targeting nationals of the coalition countries’. Naved B, a 23-year-old Pakistani asylum seeker, had been detained in the immediate aftermath of last night’s carnage following a tip-off from witnesses. But Naved B, who had no blood on his clothes and no injuries, denied having anything to do with bloodbath. It means the killer lorry driver remains on the loose and armed with a gun. Berlin prosecutor Holger Münch has warned of a ‘serious threat’ of another ‘significant’ terror attack and Berliners were urged to stay indoors. 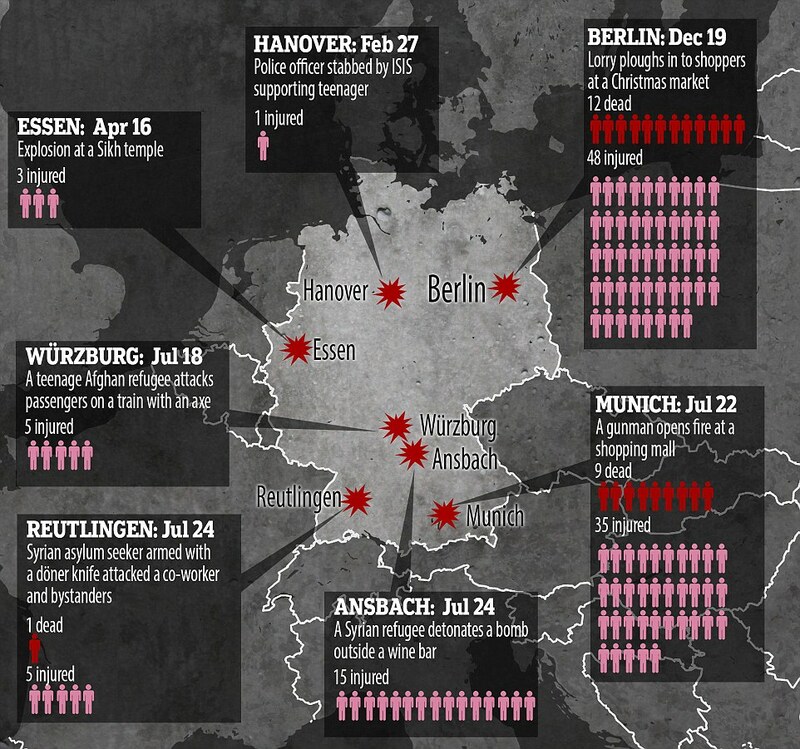 Meanwhile Interior minister for a German state, Klaus Bouillon, said that Germany is ‘in a state of war’ after the massacre on Breitscheidplatz Square last night – the seventh in the country this year. 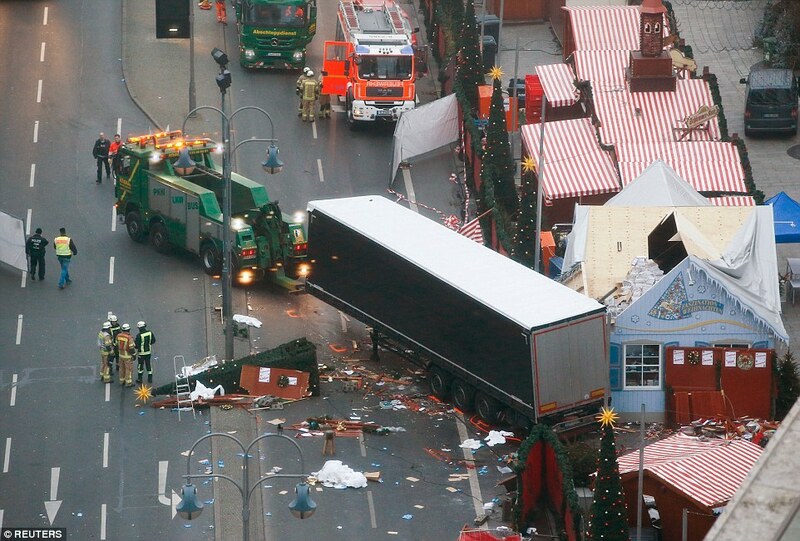 Terror attack chain of events: The polish lorry was hijacked when it arrived in Berlin and hours later was driven through Christmas market crowds. The main suspect was pursued on foot and arrested – but it appears he is the wrong man. Naved B matched the witnesses’ descriptions of the truck driver, but investigators have not been able to prove he was in the cab at the time of the attack, prosecutors said tonight. Germany’s top prosecutor Peter Frank also said earlier that they cannot rule out that more than one person may be on the run, adding Naved B ‘may not have been the perpetrator or belong to the group of perpetrators’. Tonight the Islamic State claimed responsibility for the fatal attack. At 7pm last night a juggernaut laden with steel cargo turned off its lights and ripped through stalls and shoppers at 40mph on Breitscheidplatz Square, outside the Kaiser Wilhelm Memorial Church in the German capital’s main shopping area. Witnesses said victims including children were sent flying like bowling pins and sucked under the wheels leaving ‘rivers of blood’ as the killer driver steered at them before jumping out of the cab and racing from the scene. Only six of the nine dead have been identified but Italian Fabrizia Lorenzo, 31, transport specialist worker is missing and her mobile phone and travel pass were found in the crash zone. 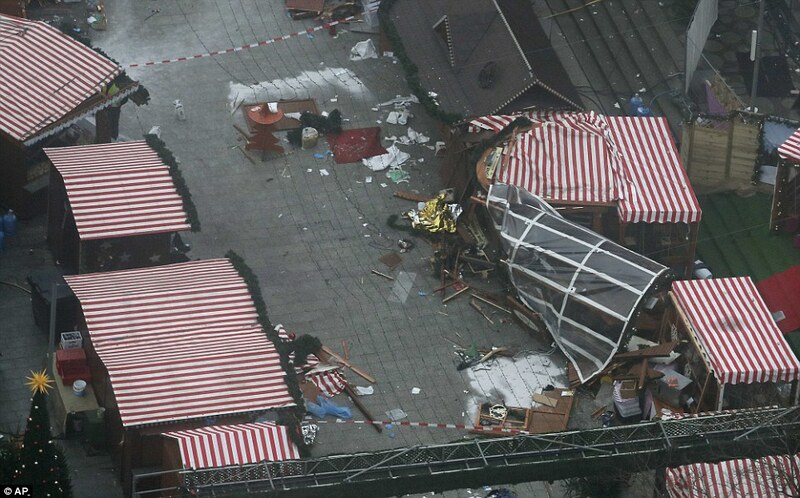 12 people are dead and 48 are injured – 16 seriously – after a lorry is driven at 40mph through crowds at the famous Breitscheidplatz Square Christmas market at 7pm last night. 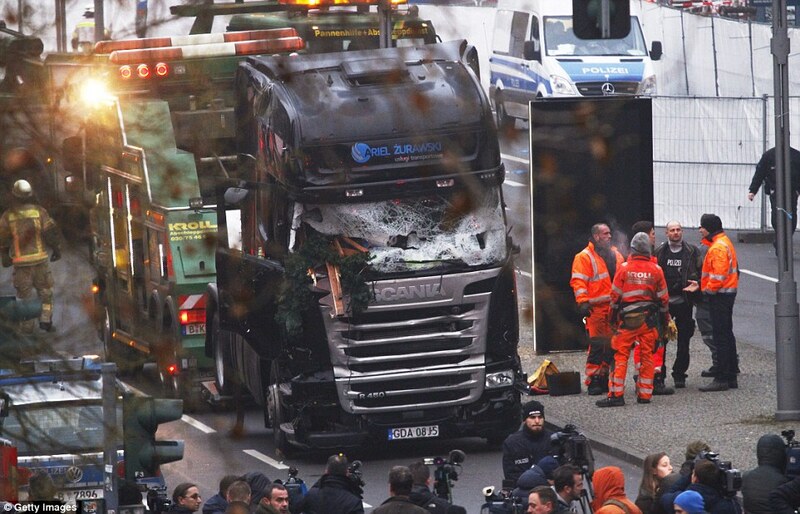 Hours earlier the lorry was hijacked from a Polish driver taking steel to Berlin from Italy. Lukasz Urban, a father of one, was found shot dead in its cab. It is not yet clear when he died. Witnesses to the massacre saw a masked man flee the lorry. A member of the public chased the Pakistani suspect Naved B, who was arrested in the Tiergarten park. Police have since released the suspect, admitting they have insufficient evidence to tie him to the rampage.Berlin’s police chief Klaus Kandt said the ‘dangerous criminal’ behind a deadly truck rampage may still be on the run whileInterior minister for a German state, Klaus Bouillon, said that Germany is ‘in a state of war’ after the massacre on Breitscheidplatz Square last night – the seventh in the country this year. ISIS supporters used an encrypted messaging service to call for more attacks just half an hour after the Berlin Christmas market atrocity, it has emerged. A German-speaking fanatic reportedly urged members of the terror group to carry out a repeat of the mass killing using tactics ‘the enemy can never stop’. Police said a ‘hero’ witness in the Christmas market gave chase on foot while giving officers second-by-second updates on his phone, but now they believe Naved B is the wrong man. 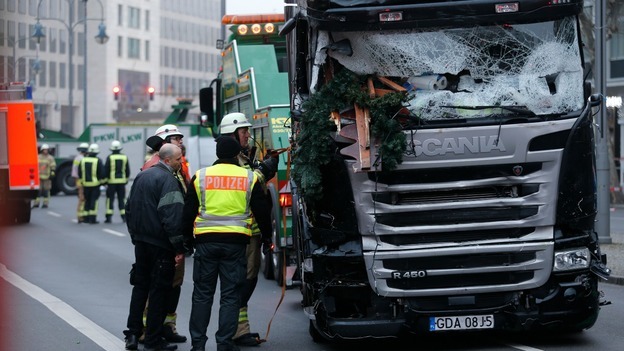 The lorry’s original Polish driver, Lukasz Urban, a father of one, was transporting steel beams into Germany, but was found shot in the cab after the crash. The gun has not been found. The terror attack could be a political disaster for Angela Merkel, who will seek a historic fourth term as German Chancellor next year. The German leader, who left white roses as the scene this afternoon, has staked much of her political capital in opening up Germany’s doors to refugees and in doing so divided a reunited land. If you remember the July 2015 attack in Nice France last year you see that the suspect Naved B was let go by police as part of some form of collusion.